The Rolling Stones sang, “You can’t always get what you want. But if you try sometimes, you just might find, you get what you need.” This describes the Aquarius and Pisces relationship perfectly. If you’re looking for what you want, you will not find it in these two star signs. 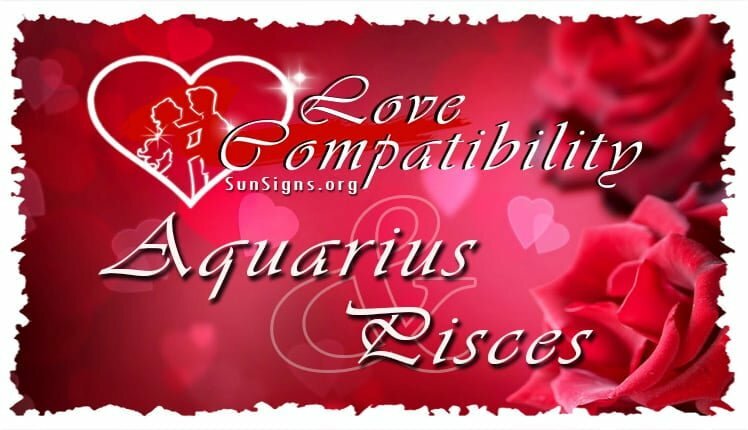 However, if you’re searching for what you need, then the Aquarius Pisces love compatibility will compliment each other in wonderful ways. Here is one of the main positive elements of a Pisces and Aquarius love compatibility. If the fish is honest with his or herself, he or she knows that they are the admirers of the zodiac. A Pisces loves to be with someone that they admire, look up to and, most of all, they can brag about. And who better to fulfill this role, but the visionary Aquarius. This intellectual innovator is usually on the cutting edge of whatever he or she is working on, and Piscean is right there, bursting with pride, cheering you on. And they’re not bashful about bragging to their friends. This bolsters the Pisces personality‘s self worth immensely. And when it comes to the home, someone has got do the dirty work of remembering the details of life. Face it Aquarius, you’re too busy coming up with innovative ideas to be bothered with these trivial tasks. On the flip side, you then get confused when there’s no hot water, because of an unpaid bill. This is why you need a Pisces birthday partner. If the Pisces man or Pisces woman loves you, they will want to make your world as comfortable as possible, and they do so by intuitively watching for what you need. You won’t need to ask for a glass of water, your Pisces lover will already know you’re thirsty. And if you have one or more fire signs in your chart and you crave the spotlight, that’s okay with your adoring fish. They don’t need attention from the crowd; they only desire your attention and appreciation. With the Aquarius Pisces in bed, the fish needs their Aquarian lover’s attention. The Aquarius personality is an inventive lover, always thinking up new and innovative ideas; whereas Pisces is a tactile lover, always looking to please their lover through sensuous touch. This combination, if managed right, has the potential to be explosive…in the most positive of ways, if you know what I mean! Expect these Aquarius Pisces sexually to try every position of the Kama Sutra, and come up with a few of positions of their own! So Aquarius, if you recognize that someone needs to care for you and take care of the drudgery in life, a Pisces partner is for you! And Pisces, if you want someone to expand your horizons, in and out of the bedroom, then an Aquarius partner is for you! There are a few negative aspects of Aquarius and Pisces compatibility, but mainly their one obstacle is getting their relationship off the ground. Aquarius tends to be aloof and Pisces tends to be evasive and indirect. This doesn’t bode well for these two stars to connecting. Here’s an example: Pisces fancies Aquarius, so much so that his or her heart bursting with love…on the inside. He or she will think of stratagems to contact the water bearer without potentially getting hurt or rejected, like sending anonymous messages or leaving an unmarked flower their intended’s desk. Here’s the problem, the Pisces male or Pisces female is not obvious enough because he or she is afraid of getting hurt. And Aquarius men or Aquarius women are so oblivious and aloof that the attempt ends up being a near miss, instead of a loving relationship. These strategies can come off seeming creepy which is a total turn off to the free spirited water bearer. So, despite Aquarius Pisces in love being a well suited zodiac match, this is why we don’t see many Aquarius dating a Pisces. Also, in the Aquarius Pisces marriage, the fish has a long emotional fuse and you have to breech their invisible boundaries multiple times before they explode. But when they explode, it seems to come out of the blue for their unsuspecting partner. Why? Because the Piscean doesn’t like to set emotional boundaries and he or she does not like to say “no” even when they should! This mutable sign hates confrontation, even if it might benefit them in the long run. So, a particular incident that you have been doing for years may be the last straw for your Pisces partner, but you’ll never know. This is coupled with the fact that Aquarius just does not understand emotional boundaries, because he or she is not in touch with their emotional side. So for the water bearer, this is like walking through a minefield that they don’t even know is there, until it’s too late! Pisces sun sign also has the tendency to be a wet blanket for Aquarius’s fun. This is because they have a tendency to cling too tightly to free-spirited Aquarius. This is bad news for the fish, who triggers the water bearers’ instinct to fly when he or she feels pinned down that tightly. And there is also the issue of faithfulness in this Aquarius Pisces friendship. Aquarians don’t think twice before having affairs outside their relationships. The Pisceans are very faithful and will not tolerate cheating. This drives the Pisces to question what he or she has done so wrong that his or her Aquarius lover strayed. And the truth is they have done nothing wrong. The Aquarian is true in his or her own way. But this is no consolation for our sensitive Pisces, I’m afraid. Each star sign has a life lesson, and one of Pisces’s lessons is to learn how to assert boundaries. And you can do it without fear of rejection, Pisces. For both of you, try not to pour yourself into the relationship so much that you forget who you are. And for goodness sake, take a real risk and lose the strategies! The only way to win your Aquarius lover over, Pisces has to be obvious; otherwise they’ll miss the signal all together. Likewise, Aquarius needs to understand Pisces definition of faithfulness, in conjunction with his or her own. He or she must understand that a thoughtless dalliance could lead to an Aquarius Pisces breakup. In conclusion, if sensitive Pisces can take a risk beyond their normal evasive relationship tactics and (sometime quite literally) hit Aquarius over the head with his or her relationship proposal, the results can be wonderful! Aquarius, you’ll have a partner that will work with you in every way, quietly and intuitively anticipating your needs. And the love making reaches such a magical plane, that the even ancient texts can’t illuminate it’s equal The key to the success of the Aquarius Pisces love compatibility is that the fish is allowed to have their boundaries and assert them and the water bearer must treat their partner as the gift he or she is to the relationship.